All bodies of water possess a dynamic balance of microbiological activity. In hydroponics, we strive to keep the nutrient solution as sterile as possible, but nonetheless, nutrient solution is by its very nature the perfect place for things to grow. Some microbes require dissolved oxygen to live (aerobic), and others do not (anaerobic). As a general rule of thumb, aerobic bacteria are "good," and anaerobic are "bad." Put simply, the byproducts of anaerobic respiration are acids that wreak havoc with chemical and biological balances within the nutrient solution, which in turn harms the root system. Warm, stagnant water holds little dissolved oxygen, making it an ideal breeding ground for anaerobic bacteria, many of which (Fusarium, Pythium) cause crop failure as they take up home in the fragile root system and proliferate. The foul smells associated with warm stagnant water (sewers, swamps) is caused by these "bad" bacteria. Methane gas (swamp gas) is a highly flammable "natural" gas that is also a byproduct of anaerobic bacteria. Can you see how, left unchecked, these bacteria can ruin a crop? 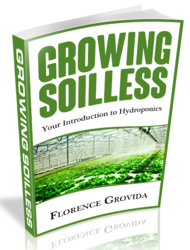 Rampant pH swings, swampy smells, root rot and ultimately crop failure are the tell tale signs of a poorly balanced biology within your system. 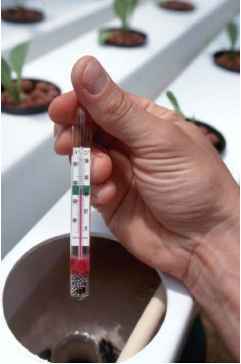 An inexpensive aquarium-type submersible thermometer is a great way to monitor the temperature of your nutrient solution in both the reservoir and growth chambers of recirculating hydroponic systems. Combating this problem is simple, once you know its causes. First of all, warm water holds less dissolved oxygen than cool water, so keep your nutrient temperature between 68-75 degrees F. Secondly, keep the nutrient circulating so it's constantly picking up oxygen. Anywhere there is falling, spraying or rapidly moving water, you can assume dissolved oxygen is being added. 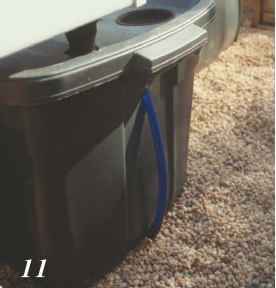 If you have a large reservoir that circulates very slowly, adding a small aquarium pump can help supply extra oxygenation. I have found however, that aquarium airstones clog with salts after just a few weeks in a nutrient reservoir. Apreferred method is to take a small bypass off the pump line to provide a bit of current within the reservoir. At the end of this bypass, I attach the end of the airline so the bubbles and nutrient flow distribute evenly throughout the reservoir. Last but not least, providing a "bacterial breeding ground" within your reservoir will help the good bacteria establish themselves and fend off the anaerobic invaders. A sponge or porous bag of horticultural perlite submerged in your reservoir will provide the perfect home for aerobic bacteria. I recommend using 1/2 gal. of perlite in a stocking for every 25 gal. of reservoir. 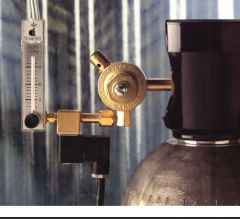 A typical CO2 setup includes (from right to left) a large tank, adjustable pressure reducing regulator and flow meter. CO2 is tricky to manage, as a result, it is generally not recommended for beginners although the rewards can be up to 40% more mass at harvest time according to recent studies. How to keep bacteria from growing in Hydroponics?